Mismatched earrings, always a bit eccentric, can brighten a sober outfit. I've always had at least one pair. 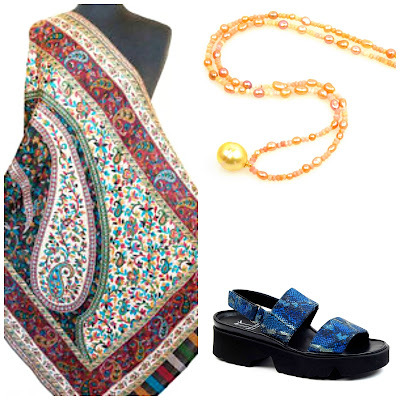 You can mismatch in many moods, from subdued to rocker. Some of the best are on Etsy, repository of quirky crafts. While a few looked like occupational therapy projects run amok, there are some standouts, and the prices are very good. 1. 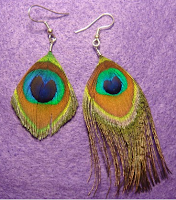 Above, asymmetrical pair of small peacock-feather earrings from Etsy seller LorenaCatalaniMorata, $14. 2. Witty sterling and polymer dots from Etsy seller susanandyerjewelry, $60. 3. 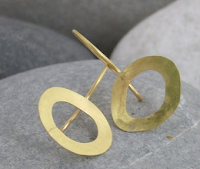 Subtly mismatched 18k gold ovals measure just over 1/2" across and 1" long (2 1/2cm long and 1 1/2cm across) from Etsy seller emmateale, $63. 4. 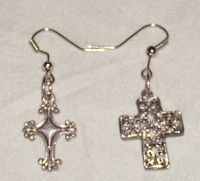 Odd little mismatched crosses, 1-inch long, $1.50 from Etsy seller MaRiKa997. 5. Arty elegance: 19th century Chinese brass and enamel earrings from Chelsea Marketeers, $198. These measure about 1 1/8 inches below a 2 1/2 inch chain. Hooks are modern. 6. 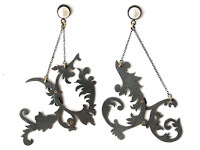 Steampun k showstoppers: Marianne Anderson earrings in oxidised silver, 18k gold and freshwater pearl. £220 (about $400 US). Seriously beautiful jewelry from a Glasgow-based goldsmith and designer. 7. The big finale: Fuoco earrings in 18k rose gold by Luna Scamuzzi for Lucifer Vir Honestus, one of my dream jewelers. 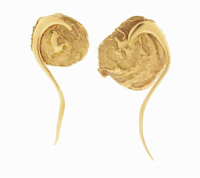 Each earring is posted, the thin squiggle of gold that dangles delicately pinned to each disc, $3,580 from Ylang 23. I say ok! And yes, my choice would also be the last ones. Perfectly mismatched. Oh yes, these are yummy! I love that last pair, bien sur! I'll vote for the last ones as well, altho' they're out of my price range. More and more, I've been relying on three or fair pair of earrings, and even of those, there's one pair (plain silver balls) I wear 80% of the time. Makes me think I should get one fabulous (and fabulously simple) gold pair, which might be a better colour for me . . . I'm not yet ready to clear out all the rest, but almost. $3450 for those gold squiggle things from Ylang 23??? I wonder if there is even $450 worth of gold in them. You must be a mindreader! I was just looking in my earring collection and feeling sad that two of my favorite pairs (isn't always the favorites?) are missing one earring apiece. But I have close cousins for each of them. I'll try this with these mismatched earrings with amber beads that I have. Thanks for the encouragement! 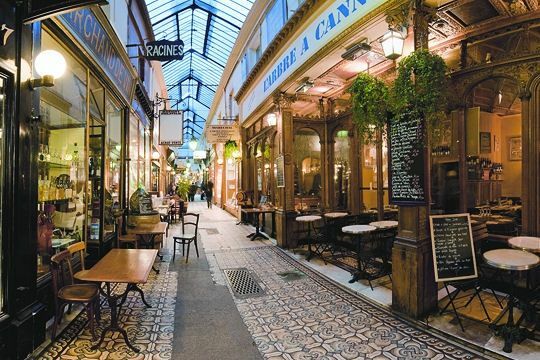 Belle: Yes, pricey- and as you know, price is also tied to reputation; LVH enjoys a cult status one. There are many lesser talents whose work I consider egregiously overpriced- David Yurman for one. One of the reasons I keep dealing with my favourite local jewelers is the level of design for the price. But oh I would buy those pearl Orbit earrings any day! 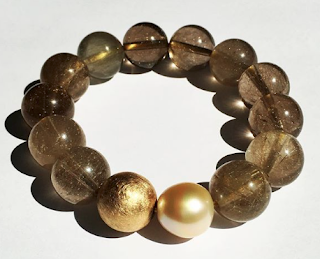 materfamilias: Think you would look (even more) beautiful in gold! I wear gold in both colours and silver but like you 3-4 favourites 80%. "Uh, your earrings don't match"- and need to be reassured it's deliberate. Have fun! LPC: I love them too- and check out her site, her work has a very specific point of view and beautiful execution. Wonderful choices. The last pair are amazing. I can't wait to get my diamond drop earrings from the jeweler. We are having the seven diamonds from my husband's old wedding ring (from his first, should never have happened marriage) made into earrings, one with three diamonds spaced on a chain, one with four. Yes, the earring with four diamonds will be longer. class-factotum: Brilliant, we would enjoy seeing them... Flickr or whatever. Have a wonderful time wearing them, they sound really special. Very cool concept, suits me just fine!